A networked system enables level control, flow rate control, pressure control and temperature control systems to be operated simultaneously. 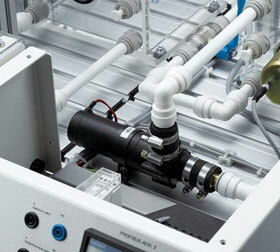 Each station is equipped with a Siemens DR19 and can therefore also be operated individually. The stations are connected to the host computer (PC) via Profibus DP. Access to the process variables of all stations is provided by the operation and visualisation software InTouch or WinCC. Training starts with individual groups of students at the individual stations tackling tasks of similar complexity. The complexity can be gradually increased later by merging the stations into one system. Adjustable centrifugal pump to ensure the right flow for every station. 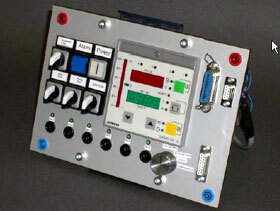 Sipart DR19 controller from Siemens – now fitted in all stations. Modern communication technology enables you to "see" the sensor from the control room. The critical question remains as to which signals are relevant for display or which intervention options should be made accessible to individual groups of people. The system provides a quick insight into complex relationships and points to trends in the latest technologies and methods through the use of hardware and software from market leaders. SIMATIC WinCC is a PC-based control and monitoring system designed for visualising and controlling processes, sequences and machines. InTouch is an interactive system for visualising, monitoring and controlling industrial processes on IBM-compatible computers. Commissioning and training on-site upon request. 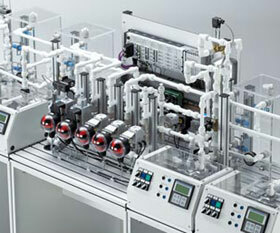 This system complements the training aims of the Compact Workstation. Commissioning and maintenance personnel: realizing bus networks. From planning, design and configuration through to realisation. Operators: process operation, monitoring and performance training as part of system management. 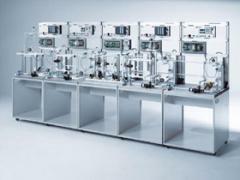 The networked system can be supplied as a version with 4 stations (level control, flow rate control, pressure control and temperature control) or as a version with 3 stations (no pressure control). 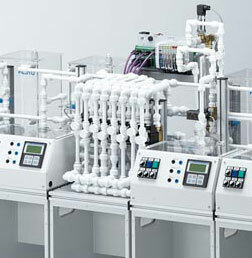 In both cases, a connecting station comprising a pump and 8x 2/2-way solenoid valves controls the flow of water between the stations. Six or eight capacitive sensors (depending on whether there are 3 stations or 4 stations respectively) monitor the level of the containers. Supplied with a SIPART DR 19 controller and S7 313-2DP.